While the rain makes the weather breezy and beautiful, it also comes with an intense craving for fried foods. The change in weather prompts a change in our menu with summery snacks giving way to inventive and innovative fried food items. But why should we restrict ourselves to tea time savouries? There’s a lot out there to satisfy your sweet tooth too. The magnificent monsoon lends itself to a rainbow of the most delicious fried desserts. Crisp on the outside, moist and sweet on the inside, these desserts will leave you drooling and tempt you to run to your kitchen. Here’s a list of 8 unusual fried desserts that will satisfy your cravings instantly. As the weather shifts from the scorching heat to pleasant skies, we all get that tingly feeling in our tummies craving for something hot and crispy. Since we’re surrounded by tons of sweets, how do we pick which dessert would be perfect for the season? It is next to impossible to resist the chocolate jalebi! A lovely combination of your favourite fried Indian dessert jalebi and chocolate. How To Make: Add a cup of flour, one tablespoon baking soda, a cup of water and a little bit of color (orange) in a bowl, mix it well and pour it into a frying pan to make jalebis with the help of a cheesecloth. Once they’re ready, dip them in a bowl of melted chocolate and serve hot. The epitome of soul food – ice-cream! Admit it or not, we all have a soft corner for ice-cream in our hearts. This time around, try the fried ice-cream. You are sure to get addicted. How To Make: Scoop 6-8 balls of vanilla ice-cream and freeze it further for an hour. After freezing, dip the balls in whipped egg whites one by one and further cover them with some crushed biscuits. Deep fry the ice-cream and enjoy. Deep fried cookie dough is one of the best fried desserts you could have asked for. Cookies always manage to lift our mood and trust us, fried cookie dough is even better. Every single bite will leave you craving for more. How to Make: Add 1 stick of butter, ½ cup of brown sugar, 2 tablespoon granulated sugar, 1 tsp vanilla extract, 1 egg, 1 ¼ cup all purpose flour, ½ tsp salt, 1 cup milk and lots of chocolate chips in a bowl to make the cookie dough. Mix them well to make cookie batter and leave it to freeze for an hour. For frying, coat the cough dough balls with corn flakes or bread crumbs and fry away. The great part about bananas is that they can be eaten with or without experimentation. To add a quirky twist to the fruit, we can fry the bananas pieces. Banana balls serve as the perfect snack for your evening coffee or tea. How To Make: Cut bananas into small pieces and mix it with brown sugar to make a paste. Add a little bit of flour, cardamom powder, desiccated coconut powder and baking soda and coat the bananas with this mix. Make little balls and fry them for tea-time. What could be better than sizzling and crispy French fries? Well, nothing really but now you can enjoy fries for dessert! These fries are made with ingredients that are used to bake a cake. This is probably one of the most unusual and inventive desserts that can be served at your weekend gathering. Serve them with a dark chocolate dip or plain maple syrup. How To Make: Add 3 eggs, 2 cups of milk, ¼ cup of granulated sugar, 3 cups of all-purpose flour, 2 teaspoon baking powder, ½ teaspoon salt. Whisk everything together for a smooth batter. Add the batter to a funnel with a large hole in order to make funnel cake strands and fry these strands to have the yummy cake fries! Sweet dumplings but covered with chocolate? Now, that sounds exquisite. Usually, modak is eaten during festivals keeping us away from it for a long time. 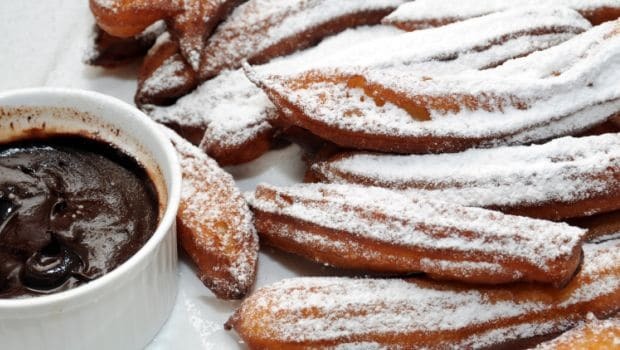 To satisfy your needs, this famous Indian dessert can now be made with a chocolaty twist. How To Cook: Take a bowl and saute one cup of shredded coconut for about 7-8 minutes. In a separate bowl, melt ¼ cup of milk and chocolate side by side. Once its melted, add the chocolate to shredded coconut and keep it aside. For the batter, take a bowl and add 1 cup all-purpose flour, ¼ cup of wheat flour, ¼ cup of suji, ½ cup of milk, 1 tsp oil, and a pinch of salt for tasting. Mix all of them together to make the dough and keep them aside for 20 minutes. Roll little puris, fill the chocolate and coconut mix in the center and shape them like a modak (tear-drop shaped) which can then be deep fried and enjoyed. Donuts have been around for years. They are a beloved American snack but are enjoyed all over the world. These donut holes originate from donuts – the portion that is cut out to make the rings. These sweet treats can be easily made at home if one is in the mood to experiment! How To Make: In a bowl, add 2 cups of all-purpose flour, 3 tablespoon sugar, 1 tablespoon baking powder, 1 teaspoon salt, 5 tablespoon cold butter, and ¾ cups of milk. Whisk them together to make a smooth batter. Make little balls and fry them into a pan. Once they’re out of the pan, roll them in a bowl of sugar. You can even glaze them if you like and serve with jam or caramel sauce. This fruity dessert that can easily satisfy your sugar cravings. This dessert gives you everything that you are looking for to enjoy the nippy weather. They are best served warm and crispy and give you a beautiful fruity taste. How To Make: In a large bowl, whisk together 2 cups of flour, ¼ cups of granulated sugar, 2 ¼ baking powder and 1 teaspoon of salt. In another bowl, whisk together ¾ cups of milk, 2 eggs, 2 tablespoon butter and ½ tsp vanilla. Gently fold the milk mixture into the flour mixture. Cut the apples into circular slices and dip them in the batter. Fry them in a pan for a few minutes and enjoy the hot and crispy fritters! Alright, we know you’re already tempted to try them. So, get going.